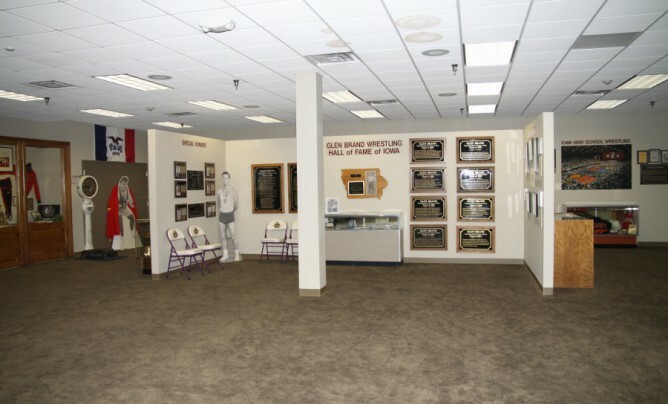 The history of Iowa wrestling comes alive in the Glen Brand Wrestling Hall of Fame. This wing features the greatest wrestlers and coaches in Iowa history. The hall is named for Glen Brand, who was NCAA and Olympic champion at Iowa State in 1948. Members of the hall of fame include every Olympic and world champion in Iowa history, plus all three-time NCAA Division I wrestling champions. as well as Nobel Peace prize winner Dr. Norman Borlaug and former United States Congressman Jim Leach. There is also a large section honoring the state’s finest high school wrestlers and programs.